We awoke at the dock back in Cairns. 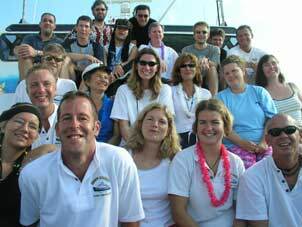 Our family of divers had grown steady stronger as the long days progressed. Many of us celebrated a wonderful trip at a great local pub this night. Justine and I have nothing but praise for the ship, the diving, but most all: her crew. I can say personally, I've never had a finer diving experience. Back on dry land, after so many days of swaying and moving, it takes a while for it to stop. So, when in the shower or looking down on your feet, most people will feel the dizzying motion of the boat long after they've left the boat. As I am right now. 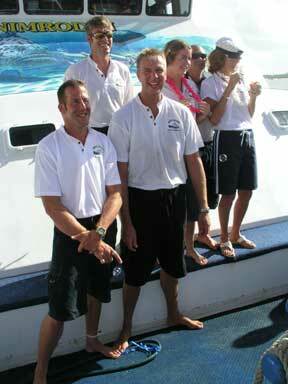 The trip was more than fantastic, the crew spectacular and the other divers a total pleasure to be around. It will take a little while to break through the comfortable pattern set during the life aboard: dive, nap, eat, repeat. This mornings send of was equally nice, witha champagne breakfast, party favors and hats for all, the group photo is a memorable one!